Whether it was the young tribal girl from Nashik in Maharashtra, Kavita Raut - who won the first track medal for India in the last 52 years in the Commonwealth Games (which was won by the legendary runner Milkha Singh and people can not stop talking about it even today), or it was Geeta Phogat, the girl from Bhiwani, Haryana, who won the gold in the 55 kg wrestling, Deepika Kumari, from Ranchi, Jharkhand, who won the gold in archery, or Prajusha Maliakkal from Chalajudy, Kerala, who won a silver medal in long jump, the story of the XIXth Commonwealth Games has a distinctively small-town flavour about it. Even Ashish Kumar, who enthralled one and all by winning a silver and bronze in gymnastics hails from Allahabad, Uttar Pradesh. Suddenly, Mumbai, Delhi, Chennai, Kolkatta and Bangalore are being put in the shade and a new sporting India is rising - from rather unexpected places. Imagine the story of Kavita Raut, who once upon a time walked 20 kilometres a day to fetch water and has her hardships to thank for her strong legs. Her story from Nashik to the Commonwealth glory is no less a fairy tale than the story of Cinderella, and this is not a one off. Many girls from humble backgrounds have risen to Commonwealth glory this time round. Indian women also took the one-two-three in Discuss. This is even more creditable if one considers what it takes to win a medal at the Commonwealth Games. I speak to Catherine Dion – the petite gymnast from Canada who has just finished fifth in the beam routine. Her routine has been fine though there have been a couple of missteps, which have ensured that she finishes outside the medals. She tells me that she is now 18 and for the last 14 years she has practiced for 25 hours a week. That is since the age of four she has spent five hours a day on the five metres long and 10 centimetre wide beam. All this for a one-and-a-half minute routine at a top sporting event and that one-and-a-half minute is so crucial that one misstep and you are history. I ask her if she is disappointed with the result and she scowls and says ‘nah not really’ and I think she half means it because there will be other opportunities and training may be an end in itself - it inculcates discipline and changes your attitude to life, though it is no guarantee of happiness. Be that as it may I believe the Commonwealth Games has been a great coming out party for so many athletes - the pomp and the ceremony of the medals ceremony is terrific. And the national anthem, the flag fluttering would make the moment unforgettable for the sportsperson. And the adrenalin rush caused by the roar of the home crowed must be memorable win or lose. Aneesa Sayyed, the shooter who went on to win a gold told her partner that that she would paint her nails the previous day so her fingers would be appropriate if she had to carry the flag the next day. It was the last day. India had 37 golds and was down to the third position on the final medals tally, as England’s total count, with its 37 golds and many more silvers and bronze medals, was more than that of the hosts. The only way India could see itself ahead was if the slim girl from Hyderabad – badminton champ Saina Nehwal could win her singles title. While the duo of Jwala Gutta and Ashwini Ponappa had ensured that India caught up with the English, with an emphatic victory in the women’s doubles, all eyes were now on Saina. The darling of Indian sport, the 20-year-old from Hyderabad tamely lost the first game to Malaysia’s Wong Mew choo, who she had beaten on six occasions previously. Then she fought harder in the second game - it was 20 all. The Malaysian girl scored a point. It was match point. The crowd could not believe it. They held their collective breadth. A serve, a return, drop, a return, a toss and then a brilliant cross court shot by Saina in the open court and the match point was saved. From then on Saina never looked back. She won the next two points to take the game to the decider. And then she ran away with the decider winning comfortably. She took the first woman’s Commonwealth singles gold for India. It was the first time in the Commonwealth Games that England finished without a gold in Badminton. And Saina also ensured that India over took England. Fourth in Melbourne; Second in New Delhi. Who has India to thank for it’s best ever performance on the medals tally? 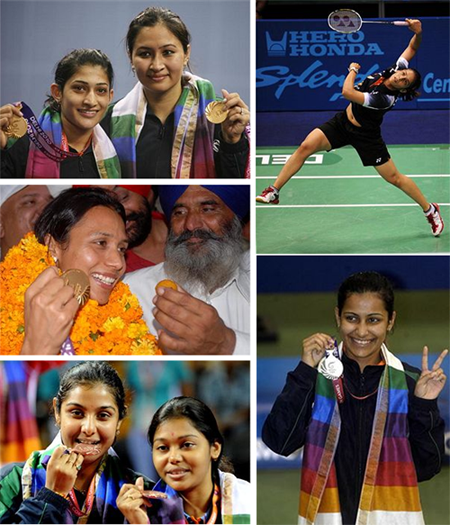 Without a doubt it’s the amazing women sportspersons.